You parquet floor yellowed over time and it doesn’t match your decor anymore? Ripping parquet floors to replace it is quite difficult, close to impossible. However, did you know that it’s now possible to restore your parquet to give it a brand new look? We suggest you here two inspiring solution that will definitely refresh its look to show an actual looking. Finitec DESIGN Paint is a radical way to change the look of a room. It offers a opaque coverage that will match the desired decor. This way, you’ll cover up the actual pattern and color of your parquet. Within the 22 colors available, pick a neutral one for a calming ambiance or vibrant one to create a wow effect and a focal point in the room. You may accessorise afterwards with assorted articles. The waterborne Finitec Design Paint is easy to use. No need to sand to bare wood, this paint may be applied with a roller, has a low smell and dries fast. So you may do it yourself in the same day. You want to keep the pattern of your parquet floor but don’t like the yellow finish of your wood? That’s simple! Opt for Finitec waterborne stain. You have to sand to bare wood, apply the stain with a cloth and reapply 3 to 4 coats of Finitec finish. 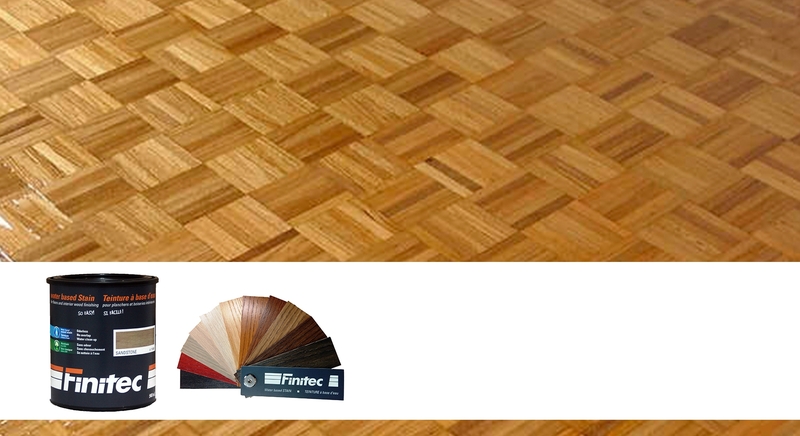 A bit more complex than Finitec DESIGN Pain, the stain offers a completely different look by keeping the parquet apparence. 11 colors available and it’s possible to mix them for many other results. In any case, it’s possible to combine the paint and the stain in the same project to create an outstanding effect.